It's clear that we love Lindsay Stripling here at ILLUSTORIA. Not only did she do the breathtaking cover for Issue 4: Grow, but she does regular features with Alexis Joseph (hi, Case for Making!) on the brief history of all of the coolest colors. A master of watercolors, she creates amazing fantastical worlds and nature-infused portraits that make you contemplate what your inner animal would be. 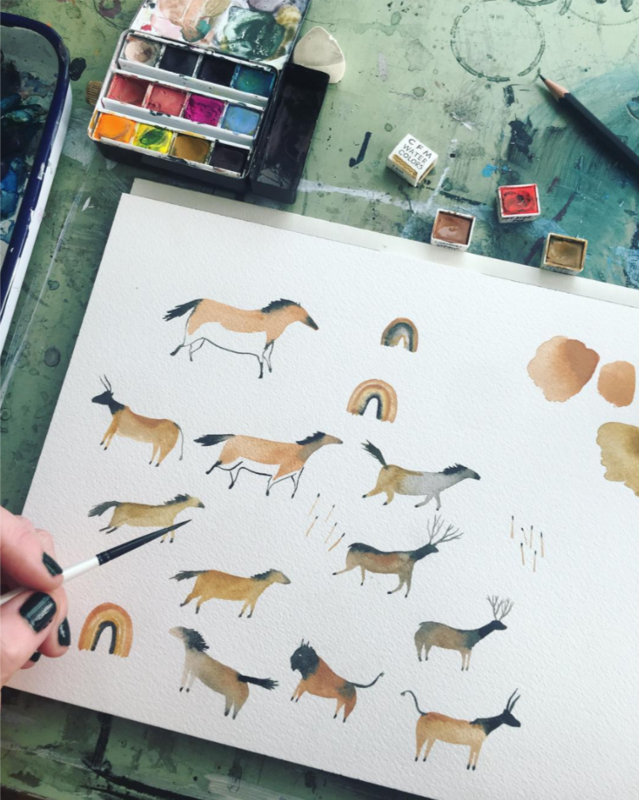 From creating a booklet series to teaching classes, Lindsay puts her expertise to spread the good word of watercolor. 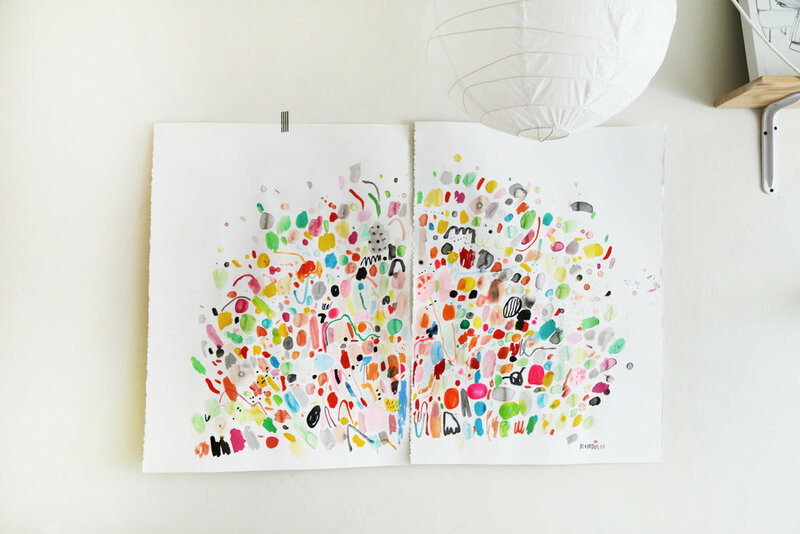 We were able to pick her brain on all things creative, so be prepared to get inspired by her rad art! Currently I am working on the second booklet in my watercolor booklets series, this one will be for people looking for expanded information on how to paint with watercolor. I planned a mural for Point Reyes Bookstore which is nautical themed, I just hung a tiny show in June at Fayes Video in the Mission District here in SF, and I am always working on commissioned paintings. How did you transition from your day job to being a full time artist? Well, honestly its still a work in progress. I currently work full time as a restaurant manager for my friends at Outerlands here in the Sunset, I teach watercolor classes at Case for Making regularly and I try and have a regular painting schedule when I am not doing those things. It is hard to balance and I think I will be taking the plunge soon into working freelance full-time, but that is a scary and exciting step, and one that I don’t take lightly. I believe in checking in with myself regularly, assessing where i am at mentally as well as financially- being an artist requires a lot of administrative work that isn’t as fun as the painting part, but over the years I have come up with my own systems that work for me. What makes watercolor your medium of choice? Watercolor is so vibrant, accessible and easy to take with me on trips- and I LOVE watercolor paper. In the last few years I have gotten to work with Alexis at Case for Making to make watercolors from scratch and experiment with color in a different way than I ever have before. We love the Brief Histories of Color series in the mag! What is your favorite color? I don’t really have a favorite color, I love all of them too much. But I do have favorite color combos- a tried and true combo is dirty pink and burgundy with a splash of neon orange but recently I’ve been really into lemon yellow and brown (think old banana). Much of your work involves half-human, half-animal characters. What would the animal-half of your body be? I was always swimming and playing different sports, and when I wasn’t doing that or going to school I was reading and drawing. I would make maps of stories that didn't exist yet because that was my favorite part of the books I would read. So many maps. I also would practice my handwriting all the time, my friends and I would spend hours drawing, making maps and copying our favorite handwriting. I think I have always wanted to do that, I just didn’t know I actually could until I was much older. I had no actual examples of people around me who were artists or writers so it didn’t feel like something that was attainable. When I got older I realized that the best thing about this world we live in is that if you want to achieve something, you just gotta hustle. The best part of that is maybe you don’t achieve that thing that you were initially hustling for but you’ll figure out what it is that you want along the way, through many failures and mistakes and realizing who it is that you are and where it is that you actually want to go. Now get lost in Lindsay's dreamy paintings and make some of your own! You can also check out Lindsay's latest features in Issue 7: Black and White!